Drag right to left for a crossing selection. Drag left to right for a window selection. 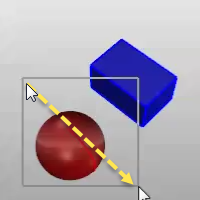 When multiple objects can be selected, press Enter when you are done selecting. For many commands, you can select sub-parts of objects or specified object types to allow you to restrict selection in a tight area. Ctrl + Shift + Left mouse click, window, or crossing. 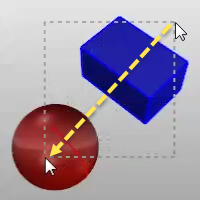 Surface, polysurfaces, and extrusion object vertices. These are the equivalent of the points enabled by SolidPtOn.